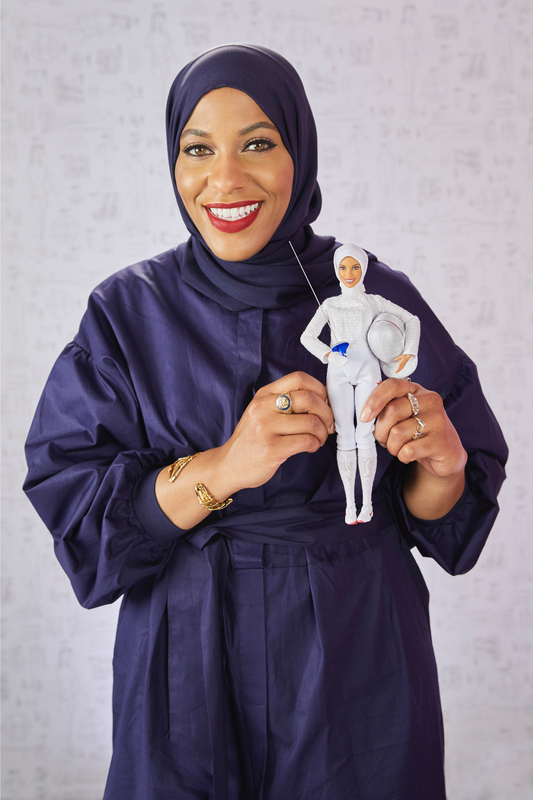 EL SEGUNDO, Calif., November 13, 2017 – Today, Mattel honors Ibtihaj Muhammad, the first American Olympian to compete while wearing a hijab, as a Barbie Shero by gifting her a one-of-a-kind doll in her likeness. The doll was unveiled at the Glamour Women of the Year LIVE Summit, an annual event that gives young women the opportunity to hear from select past and present Women of the Year honorees, as well as other influential leaders from a variety of fields, in Brooklyn, NY. Muhammad is the latest honoree as part of Barbie Shero program that recognizes women who break boundaries to inspire the next generation of girls. Muhammad was presented this doll by last year’s Shero, body activist and model, Ashley Graham. One of TIME magazine’s "100 Most Influential People" of 2016, Muhammad not only breaks boundaries with her swordsmanship, but with the launch of her clothing line, Louella. Noticing a gap in the marketplace, Muhammad designs new fresh and vibrant looks for the modest fashion industry. The doll will be available for purchase in 2018. For more information and images, visit www.Glamour.com/woty.